In addition to the default Microsoft Outlook Calendar, you can create other Outlook calendars. For example, you can create a calendar for your personal appointments, separate from your work calendar. In Calendar, on the Folder tab, in the New group, click New Calendar. In the Name box, type a name for the new calendar. The new calendar appears in the Calendar Navigation Pane. To view a calendar, select the check box for the calendar. When multiple check boxes are selected, the calendars appear in side-by-side view and can be switched to the calendar overlay view. For more information, see View multiple calendars at the same time. Tip: To delete a calendar, right-click the calendar name in the Navigation Pane, and then click Delete calendar name. In addition to the default Microsoft Outlook Calendar, you can create other Outlook calendars. For example, you can create a calendar for your personal appointments. In Calendar, on the File menu, point to New, and then click Calendar. Note: If you are in Mail, Contacts, Tasks, Journal, or Notes, on the File menu, point to New, and then click Folder. In the Folder contains list, click Calendar Items. 1. Type the calendar name as you want it to appear in the Navigation Pane. 2. Make sure Calendar Items is selected under Folder contains. 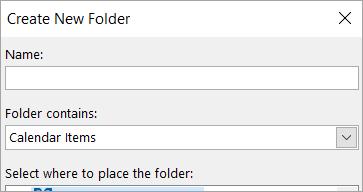 In the Create New Folder dialog box, in the Name text box, type a name for the folder. To view a calendar, select the check box for the calendar name. When multiple check boxes are selected, the calendars appear in side-by-side view.